For the purpose of understanding the evolution of our economy and our quality of life, if there was ever one definitive graphic, this is it. However, to understand the current creative, knowledge-based, whole new mind economy from an individual’s point of view, you have to get to know the work at ThinkStudio, a global think tank based in Switzerland. 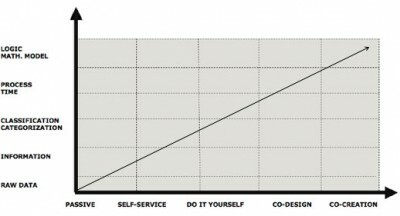 The chart above illustrates the direct economy, where “customer knowledge is replacing producer knowledge”. ThinkStudio illustrates this economic model through the two dimensions of interactivity and knowledge. 1. Passive – Listening to music, surfing the web. 2. Self service – eBay, Amazon, iTunes. 3. Do-it-yourself – IKEA, mixing music. 4. Co-design – Wikipedia, blogs. 5. Co-creation – Linux, open source, crowdsourcing. 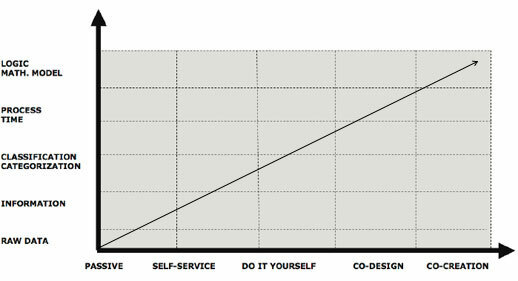 To reach the level of creative enthusiasm, that’s about heading to the top right of the chart… and the future of our economy and culture. With the basics of the direct economy explained, we can delve deeper into how we can individually make this happen locally. Stay tuned. Read more about the direct economy via ThinkStudio’s resource page.